Is your company using behavioral economics to control costs? Take our short (3 question) quiz to find out! 1. Population Health: Which wellness incentive phrasing results in higher participation? A. Complete the Health Risk Appraisal and required Biometric Exams within the next 12 months and receive a $100 gift card after the end of the plan year. B. Complete the required Biometric Exams within the next 3 months and earn $50. C. Complete the Health Risk Appraisal within one month after receiving your Biometric results and earn $50! Health Care Consumerism: Employees have choices at open enrollment for three medical plans. 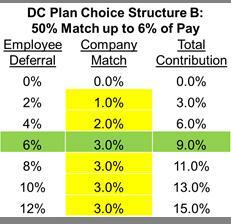 Which default option (A, B or C) will result in the highest enrollment in the Qualified High Deductible Health Plan? DEFAULT A: If you don't make a positive election during open enrollment, you will continue in the same medical plan as last year. DEFAULT B: If you don't make a positive election during open enrollment, you will be dis-enrolled from coverage. DEFAULT C: If you don't make a positive election during open enrollment, you will be enrolled in the Qualified High Deductible Health Plan. 3. 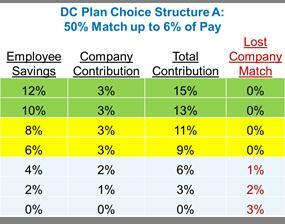 Retirement Readiness: Click on the defined contribution plan chart below which would typically result in higher deferrals. Please select one of the following images.